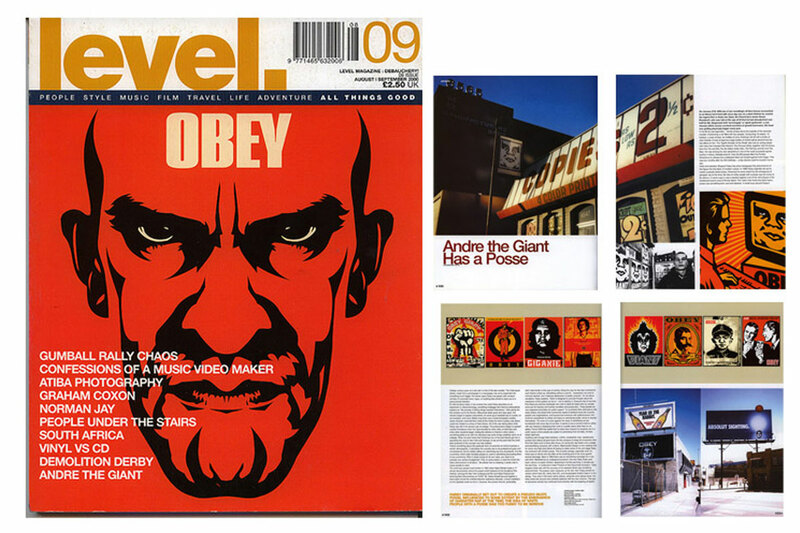 Capsule held the first UK exhibition outside of London for artist Shepard Fairey aka GIANT in 2000. Unique silk screen prints were exhibited alongside prints most commonly seen billboarded on the streets of American cities. Fairey plays with society’s worship of corporate icons and logos in an experiment in phenomenology. The exhibition took place at the former Medicine Bar, within the Custard Factory in Digbeth with Fairey’s work also invading the streets of Birmingham city centre. He first became known for his “Andre the Giant Has a Posse” (…OBEY…) sticker campaign while attending the Rhode Island School of Design (RISD), which appropriated images from the comedic supermarket tabloid Weekly World News. The exhibition was featured on the front cover of Level Magazine with a 6 page article.